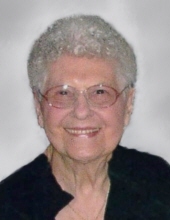 VERNA O. JOHANNSEN-PECK, 104, of 819 Brookview Drive, DeWitt, IA, formerly of Fulton, IL, died Tuesday, January 22, 2019 at Clarissa C. Cook Hospice House in Bettendorf, IA. Cremation rites have been accorded. A Celebration of Life service and interment at Fulton Township Cemetery will be held at 11:00 AM, Saturday, April 6, 2019. The Fulton Chapel of the Bosma-Renkes Funeral Home is assisting with the arrangements. The family has established a memorial to the Fulton Presbyterian Church. Verna was born May 21, 1914 to Sherman and Clara E. (Senneff) Oakley, in York Township of Carroll County, IL. She was educated at Ideal School in rural Carroll County. On April 9, 1939 she married Harlan E. “Hots” Johannsen in Clinton, IA. He died April 5, 1982. Later she married Raymond F. Peck on December 17, 1987 in Clinton. He died June 22, 2002. Verna was a homemaker and enjoyed gardening, cooking and baking. She was a member of Fulton Presbyterian Church. Her hobbies included growing and caring for African violets and playing cards. Verna was an avid Cubs Fan. She enjoyed spending time with her family, especially her granddaughter and great granddaughter. Survivors include her daughter, Mary Hamm of DeWitt, IA; a step daughter, Rosanne (James) Peska of Fulton, IL; two step sons, Raymond (Linda) Peck of Clinton, IA and Patrick (Susan) Peck of Wilton, IA; one granddaughter, Rebecca (Chris) Griebel of Calamus, IA; one great granddaughter, Kinzie Anne Griebel; many step grandchildren and step great grandchildren. Verna was preceded in death by her two husbands, Harlan Johannsen and Raymond Peck; four sisters, Lula Grimm, Laura Maydew, Beulah Bower, Helen Ashby; one brother, Paul Oakley. To send flowers or a remembrance gift to the family of Verna O. Johannsen-Peck, please visit our Tribute Store. "Email Address" would like to share the life celebration of Verna O. Johannsen-Peck. Click on the "link" to go to share a favorite memory or leave a condolence message for the family.